"I tend to enjoy a generous ratio between nuts and pastry, as that makes me feel a little bit better about the copious amounts of sugar in this, but above and beyond that, I think this approach produces the best texture. You can use as many layers of filo as you want, but be careful, since too many may not cook through, and the only way to mess this up is to undercook the dough. The top and bottom layers need to dry out, and thoroughly crisp up, otherwise, once the syrup gets ladled over, you'll have a soggy mess." Place walnuts, pistachios, and cinnamon in bowl of a food processor. Pulse on and off until mixture is chopped but not too fine. Sprinkle with 1/3 of the nut mixture. Top with a sheet of phyllo and drip with melted butter; repeat with 1 more sheet of filo. Add another 1/3 of the nut mixture. Place another sheet of phyllo on the nuts; drip with butter. Top with another sheet and drip with butter. Add the remaining nut mixture. Top with 2 sheets of phyllo; drip with butter. Add 2 more sheets; drip with butter. Top with the last 2 sheets and drizzle generously with the remaining butter. Cover pan with plastic and refrigerate until completely chilled, about 1 hour. Cut baklava into about 12 diamond-shaped pieces approximately the same size. Bake in preheated oven until browned and crisp, about an hour. Place sugar, honey, and cloves in a saucepan. Pour in water. Place pan over medium-high heat and whisk to combine. Bring to a boil; remove from heat. Whisk in vanilla and orange blossom water. After baklava has rested 5 minutes, ladle syrup over the top. Cool down to room temperature before serving. A sweet, crisp, buttery and crunchy good treat! If you want to use homemade phyllo dough, use 16 sheets in the baklava. Get the recipe for Chef John's Homemade Phyllo Dough. 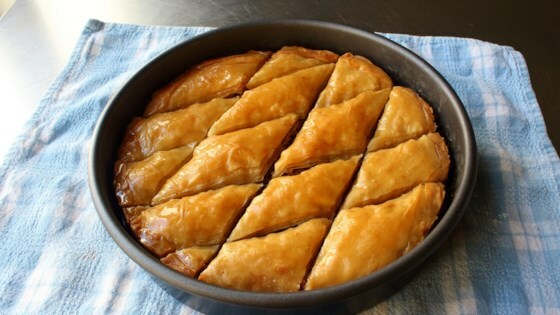 This was the best baklava that I have ever eaten, and surprisingly simple to make. yes, I will make it again but I would cut the sugar syrup down by 1/2. The baklava was literally floating in sugar syrup. I used the store bought dough which made it easy to put together. The syrup had great flavor but mine was a little thin. Will reduce the water next time. Used walnuts, pistachios and pecans.